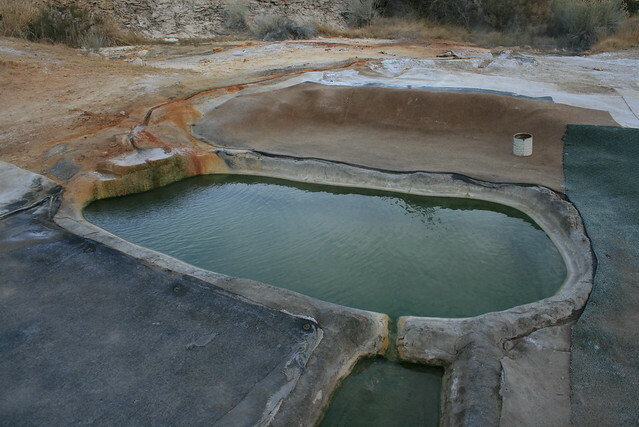 South of the small town of Bridgeport in the valley of the same name is where you will find the highly sought after Travertine Hot Springs. 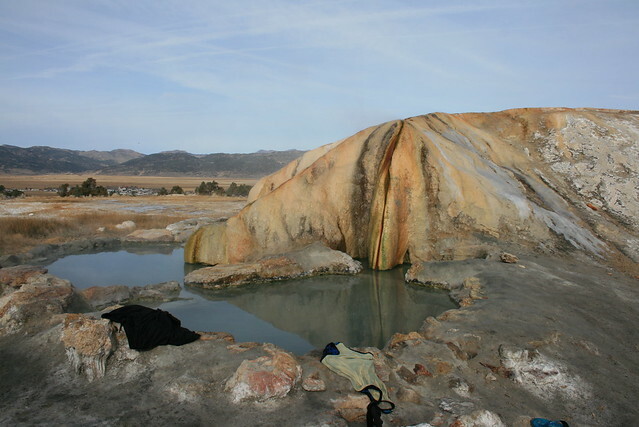 Located on Humboldt Toiyabe National Forest public land, generous views of the Eastern Sierra’s Sawtooth Ridge can be enjoyed while soaking in the hot pools. The first and largest of 4 pools is an ADA-accessible cement walled tub and is literally right next to the parking area. The remaining 3 smaller pools have rock and mud walls with clay travertine bottoms and can be found by following a trail behind the bathroom to a grass meadow. Hot springers visiting Travertine are well known for covering their bodies with clay and rarely wearing swimsuits. The largest pool can comfortably situate a group of 6 while each of the smaller pools has enough room for 3 people. As always, pack it in – pack it out! Take Highway 395 about a half mile south of Bridgeport. Turn west (left) onto a paved unmarked road (Jack Sawyer Road) that quickly turns into a dirt road. Follow the graded dirt road about 1 mile to the parking area. Jack Sawyer Road is not maintained during winter when the road is frequently covered by snow. Please use extreme caution when visiting during winter. Sadly, this hotspring is now so over used that I got a horrid bladder infection from soaking in the tubs. This means that unclean people are using the tubs without first washing their bottomside. It was horrible. I had just showered before I came to the site myself, but others are not always able to do so and the water quality pays the price. If you want e-coli in your tub, go for it. I was in the small tub. Just gross.